Garden trampolines combine fun and sports and make a lot of fun for everyone. I purchased the inground Berg trampoline. The product is fantastic and is of superior quality to other similar products I had looked at. Trampoline is great and was very easy to assemble. We love the large size. The net is good and easy to use with no zip for the kids to do up. You need to be fairly tall to get the protective sleeves on the poles - we did struggle but you could maybe take a step on to the trampoline to manage. It is nice that net is over trampoline and mat as you can then sweep leaves etc off the trampoline fairly easy. Garden trampolines offer a great combination of fun and movement in the fresh air. It makes such a fun, when you jump up and down on a trampoline and feel like weightless. For sure, that's the main reason why so big outdoor trampolines can be found in many gardens. Besides the fun, every garden trampoline offers another great advantage: it keeps in shape. Like the rebounders for joint-gentle fitness training at home, the funny jumping on a garden trampoline trains the muscles. 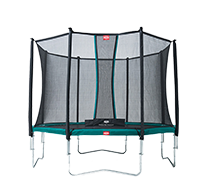 In the following text we want to show you the most important differences and quality features of outdoor trampolines and explain how to find the proper garden trampoline for you. 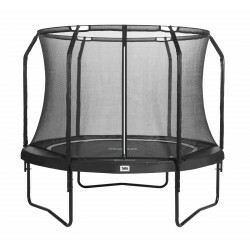 Outdoor trampolines are available in diameters from 180 cm to 530 cm. The right size for you should mainly depend upon to factors: on the hand hand from the size of your gardne and on the other hand from the age of the users. On principle: the bigger the trampoline diameter, the more fun you will have! The space-efficient Talent line of the company Berg can already be sufficient for very young and small children. 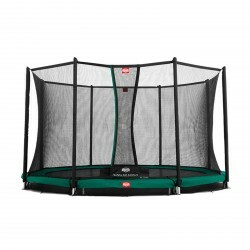 These outdoor trampolines start already with a diameter of 180 cm and to a maximum of 300 cm. The trampoline should be bigger for taller children and adults. Here the size matters! Please always pay attention to have a safety space all around the trampoline. 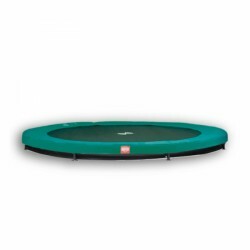 Besides the classic round trampolines, there are also square trampolines like the InGround Eazy Fit. These offer the advantage that they are easier to store. Should you move your trampoline more oftne, we would recommend a square trampoline. 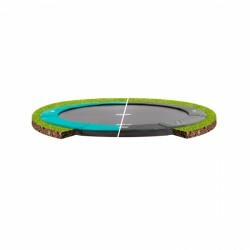 In addition, the square outdoor trampolines are lighter to adjust to the garden surface. The jumping on a square or a round garden trampoline is hardly different. A high-quality workmanship of the trampoline is the most important condition for a long durability and fun to jump. High-quality models have, i. e., a galvanized tube frame and high-quality welded seams. These two facts are important for the maximum lifespan of your garden trampoline. A good jump experience on a garden trampoline depends upon different features. On principle: the bigger the jump surface, the better is the jump quality. An important criterion for good jumping is the suspension. More high-quality trampoline springs are of stronger workmanship or also double suspended. Good springs do not only support a smooth and comfortable jump but are also decisive for a long durability of your trampoline. Trampoline springs of high material quality do not rust and do not wear out. The brand manufacturer Berg offers from the model line Champion so-called Twinspring Gold springs. 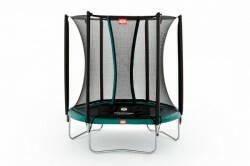 This double spring system with suspension offers maximum jumping comfort. A quality and safety aspect is the padding of the edge cover. A thick and large padding on the edge of the trampoline safes the trampoline from damages. Please make absolutely sure that the trampoline padding covers the springs completely. In the meantime, the floor trampolines or inground trampolines of our brand manufacturers Etan and Berg belong to the standard range. The advantage of an inground trampoline is that it can be placed unobtrusively in every garden and is just above the ground. Beforehand, a respectively big hole is digged and the trampoline is placed above it. 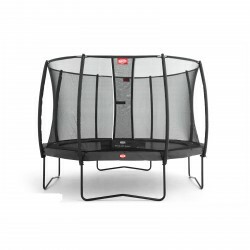 The trampoline quality is identical to the classic standing trampoline. 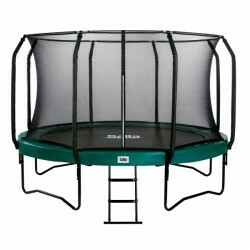 In order to ensure highest jump comfort and a maximum safety, a trampoline with safety net is recommendable in any case. Contrary to some statements, a safety net is not suitable to jump against it. It rather protects small children from climbing down the trampoline on their own. Berg offers, i. e., two different nets; the Deluxe net is more stable and more resistant. The garden trampoline with safety net has prevailed since many years. 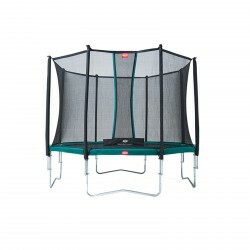 Many trampolines for the garden are delivered with an appropriate safety net as standard. For example, you can throw in some balls and try the one or the other shot while jumping. 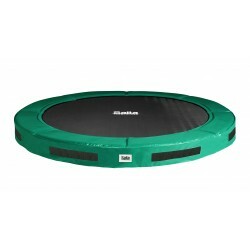 Every trampoline has an indication for the maximum user weight. We recommend you to take these indications as orientation. Garden trampolines definitely resist the indicated weight, though you should always bear in mind this value to offer a safety of 100%. This indication should also be considered when, i. e., two children jump on the trampoline at the same time. The ladder is a very practical accessory for your standing trampoline. The ladder allows especially small children an easy getting on and off. If you leave your trampoline standing no matter what's the weather, we recommend a fixation set. The fixation set consists of ground pegs, which fix the trampoline even better. Thus, your trampoline is ideally protected from wind and weather. The fixation set can be used for standing or inground trampolines. A cover is recommended for trampolines without safety net. The cover protects the high-quality jumping surface from humidity and dirt, i. e., because of leaves falling down. Your garden trampoline does easily resist leaves and humidity, but it can affect it visually. On principle, an outdoor trampoline makes a lot of fun for persons of every age. Regular jumpingon a trampoline keeps you and your children in shape. Please pay attention to a high-quality workmanship of the frame built and a thick edge padding when choosing a trampoline. High-quality springs allow an additional maximum fun to jump. The size of your garden trampoline should mainly depend upon the spae in your garden. A bigger trampoline always offers a bigger jumping surface and fun for persons of every age. 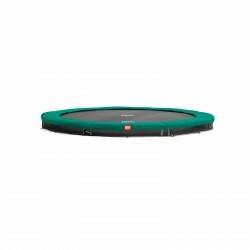 In order to focus on safety aspects as well and increase the fun to jump at the same time, we recommend you a trampoline including safety in any case. If you want to place your garden trampoline as unobtrusively as possible, we recommend you to go for a ground trampoline. A cover protects your trampoline from dirt and wet. Accessory like a fixation set is recommended for every trampoline, so it resists every weather and rests in the ground with all four to eight feet.